Husband was born on July 12, 1957, in Amarillo, Texas. At the age of 17, he earned his pilot's license while flying out of Tradewind Airport. He graduated with honors from Amarillo High School in 1975. Husband earned a bachelor of science degree in mechanical engineering from Texas Tech University in 1980, after 5 years of study. Upon graduation he was commissioned as a pilot in the US Air Force, having been enrolled in ROTC his last two years of college. Husband underwent pilot training at Vance Air Force Base, in Enid, Oklahoma. This was followed by Land Survival School in at Fairchild Air Force Base, in Spokane, Washington, and Fighter Lead-in School in New Mexico. Evelyn and Rick were married on 27 Feb. 1982. Rick trained in the F-4 at Homestead Air Force Base next. In December 1987, Husband was assigned to Edwards Air Force Base in California, where he attended the USAF Test Pilot School. Upon completion of test pilot school, Husband served as a test pilot flying the F-4 and all five models of the F-15 Eagle. In the F-15 Combined Test Force, Husband was the program manager for the Pratt & Whitney F100-PW-229 increased performance engine, and also served as the F-15 Aerial Demonstration Pilot. In June 1992, Husband was assigned to the Aircraft and Armament Evaluation Establishment at Boscombe Down, England, as an exchange test pilot with the Royal Air Force. At Boscombe Down, Husband was the Tornado GR1 and GR4 Project Pilot and served as a test pilot in the Hawk, Hunter, Buccaneer, Jet Provost, Tucano, and Harvard. Husband logged over 3,800 hours of flight time in more than 40 different types of aircraft. Husband was selected as an astronaut candidate by NASA in December 1994, the same week he was promoted to lieutenant colonel. :67 He reported to the Johnson Space Center in March 1995 to begin a year of training and evaluation. Upon completion of training, Husband was named the Astronaut Office representative for Advanced Projects at Johnson Space Center, working on Space Shuttle Upgrades, the Crew Return Vehicle (CRV) and studies to return to the Moon and travel to Mars. He eventually served as Chief of Safety for the Astronaut Office. 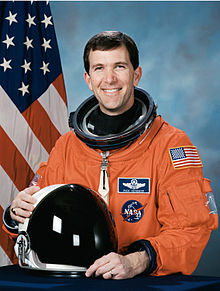 He flew as Pilot on STS-96 in 1999, and logged 235 hours and 13 minutes in space. Husband was later assigned to command the crew of STS-107 which was launched early in 2003. STS-96 (May 27 to June 6, 1999) aboard the Space Shuttle Discovery was a 10-day mission during which the crew performed the first docking with the International Space Station and delivered four tons of logistics and supplies in preparation for the arrival of the first crew to live on the station early the following year. The mission was accomplished in 153 Earth orbits, traveling 4 million miles in 9 days, 19 hours and 13 minutes. STS-107 (January 16 to February 1, 2003) aboard the Space Shuttle Columbia was a 16-day mission during which the crew performed over 80 experiments testing applications of microgravity to gain insight into the environment of space and improve life on Earth as well as enable future space exploration. The mission ended on the morning of February 1 when the shuttle disintegrated upon reentry killing all crew members (see Space Shuttle Columbia disaster). Two NASA Group Achievement Awards. Husband Hall, in the Columbia Village apartments, at the Florida Institute of Technology. Husband Mission, one of the projects in the educational SpaceLab Program, run by the Ramon Foundation in memory of Ilan Ramon. Involves the writing of new Wikipedia entries on a variety of space and STEM related topics. Husband Hill, one of the Columbia Hills on Mars. Rick Husband Amarillo International Airport, in his hometown of Amarillo, Texas. Husband Auditorium, Squadron Officer School building, Maxwell AFB, Alabama. Rick Husband Drive, El Paso, Texas. S.S. Rick Husband, the Cygnus CRS OA-6 unmanned resupply spacecraft. "It [space] was just so incredibly adventurous and exciting to me. I just thought there was no doubt in my mind that is what I want to do when I grow up." "Tell them about Jesus; he's real to me." Husband's wife Evelyn details her Christian life with Rick and his struggles to fulfill his lifelong dream to become an astronaut in the 2004 book High Calling: The Courageous Life and Faith of Space Shuttle Columbia Commander Rick Husband co-written with Donna VanLiere. The Husbands have two children, a daughter Laura and a son Matthew. Evelyn married Bill Thompson in January 2008 and was the keynote speaker for the memorial ceremony at the Astronaut Memorial "Space Mirror" at the Kennedy Space Center in Florida, five years after the Space Shuttle Columbia tragedy. ^ a b c d Husband, Evelyn (2003). High Calling. Carmel: Guideposts. pp. 12, 17, 20, 25, 27, 29. ISBN 9780785261957. ^ Jason Rhian (21 March 2016). "ULA ATLAS V READY TO LAUNCH HEAVIEST PAYLOAD TO DATE WITH 'S.S. RICK HUSBAND'". Spaceflight Insider. ^ RODRIGUES, JANETTE. "Church remembers astronauts Anderson and Husband". Chron. Houston Chronicle. Retrieved 2 December 2018.